It had been taunting me for months, sitting over in the corner. The ugly, big-wheeled machine with flat panels and sharp edges. Every time I saw it I shook my head and asked, why? But like the weather, I warmed to it. What drew me in were the dual halogen headlights and what got me intrigued to ride it were the dual front disc brakes. Why does a scooter need that much stopping power? I know for a fact the good reputation Kymco gained is justified. The fit and finish on every one of their scooters is top notch. All of the components used are without compromise, and the engines are super smooth. Hopping on the People S 250, my comfort level was immediate. The throttle response was good and the handling felt more stable than my test on the Xciting 500. At highway speeds, all of my hesitation about the looks of the bike where gone. The scooter is a dream to ride. Acceleration from 45 to 75 mph was smooth and fast. The S was as great on the city streets as it was on the highway. The dual discs up front that I was wondering about work really well. Doing quick stops, the dual discs stopped fast, and incredibly controlled. The seating position on the People S 250 hasn’t changed. It is still upright with a flat floorboard for your feet and no rise in the center. The floor isn’t very large, but adequate to fit my feet, with a couple inches to move them forward or back. The controls are standard for a scooter, with a large speedo reading with kilometers as the primary. The odometer and clock are a digital reading to the left of the speedo and are lit with a blue background. The analog gas gauge is to the right of the speedo. 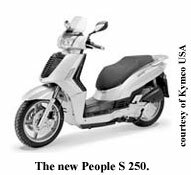 The People S 250 is 20 lbs lighter than the People 250 and has improved its power over the previous model by almost 2 hp, totaling 20hp. Improved valve timing through the use of a different cam seems to be the only change to the engine. The gas tank has also gotten larger by half a gallon. Which means you can go an extra 35 miles before you get gouged at the gas station again. The People S had a lot of strikes against it sitting on the showroom floor, but now it’s the best scooter I have ever ridden. I could see this as my daily commuter on the River Road, and also replacing the bike I use to get out of town on. Don’t let its looks scare you. This is one great machine!